ORIGINS is a show that features 11 artists and their ongoing relationship to printmaking. Each artist shares an early hand-pulled print alongside their most recent work, engaging in a conversation with how we each began on this path, as well as where we are now. It is our hope that through sharing this work, that we make visible the magic that emerges from the learning process. Join us as we celebrate endless beginnings and the threads that connect our past to our ever-evolving present. Join us this coming Friday, March 1st at 115 River Street South from 6:00-9:00pm. We hope to see you there! 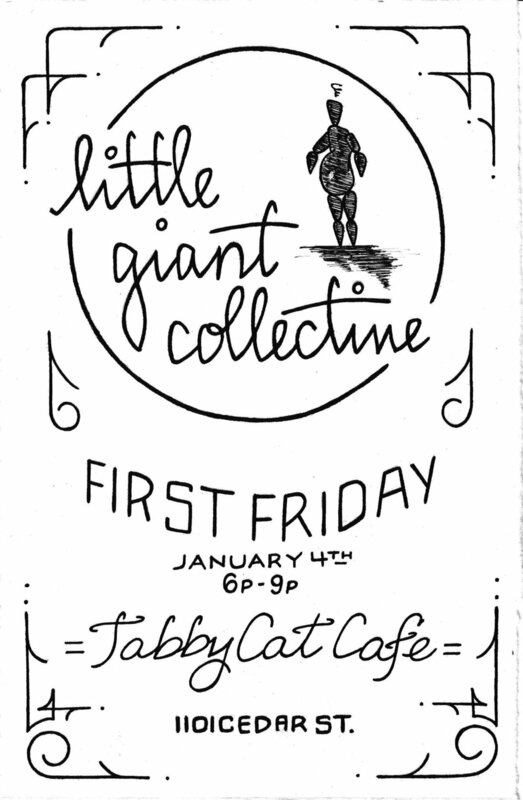 Join the Little Giant Collective 6-9 this Friday, January 4th at the newly opened Tabby Cat Cafe for a group show & print sale with interactive printing demos! Little Giant Collective is a group of 11 printmakers in Santa Cruz who are opening a collectively owned printmaking space this winter. We will be signing a lease for our new space next week, but we still need to raise $1,500 for a use permit before we can open. To raise this amount we will be selling artwork at the Tabby Cat Cafe from 6-9 on Friday, January 4th. We will also be holding print demos where you can print one of our prints yourself to take home for free! Tabby Cat Cafe was recently opened by long-time Cafe Bene employee Lisa Curran and her partner Jeb Purucker. Little Giant Collective is: Ash Armenta, Lucas Elmer, Ry Faraola, Janina Larenas, Louise Leong, Enrique Lopez, Melody Overstreet, Amanda Payne, Derek Pratt, Campbell Steers, and Vincent Waring. Dive beneath the printed word at an evening featuring the most impressive poetry and book arts in Santa Cruz County. Enjoy poetry readings from powerful new voices as well as some of the county’s most seasoned and sublime. Make monotype prints, bind booklets, learn the art of paper folding, repurpose books, and create poems with other community members. By the end of the night, you’ll be convinced that there’s much more to the story than meets the eye. MAH members get in half price. Engage in Poetry in a Time of Division with Cabrillo College students. Art can cross political divides and heal the soul. In order to celebrate the creative spirit, Cabrillo College students will read their own poems while hosting a poetry table where students will write “Poems on Demand” and inspire participants to write poems and create mini-books. Create your own monotype print using a printing press with Printmakers at the Tannery. Build a collective narrative with artist Veronica Wang’s Cyanotype Dreams. Each print will serve to capture a memory or thought that haunts you. Write your own story and create a series of cyanotypes that captures sociological hauntings. Create a children’s book through community collaboration, inspiring laughter and sharing ridiculous jokes with Giggling Geckos author Thecla Campbell. Join Little Giant Collective and Print Organize Protest with a Politics and Poetry workshop. There will be live printing political haikus on t-shirts and posters, live printing the collective’s Political Haiku book for participants to cut, fold, and take home, a large accordion book for people to contribute their own political haiku, a pamphlet bookmaking station, and a print/make your own bookmark station! Special bonus: Artwork from the collective will be available for purchase! Create your own rap and learn about creative accessibility with Creative Young Artists from the Heal for Real project. Join your library for some poetry in motion! Create a temporary poem with Kermit, the Santa Cruz Public Libraries Book Bike – add your own words to the magnetic word bank or simply see the cycle of poems change as they pedal into the creation of a veritable visual & verbal mobile work of collaborative art. Be a part of a communal poem with editors of the UCSC Chinquapin Literary Magazine. Learn, discuss, and write poetry with members of the Santa Cruz Word Church. Learn the art of Yotsume Toji with the Young Writers Program in Four Eyes and Three Lines: Japanese Bookbinding and Haiku. Then use calligraphy pens to fill the pages of your newly bound book with Haiku, Tanka and Renga. Participate in positive civic engagement by decorating postcards with art and mailing them to our representatives with Kids Art Congress. Write a collaborative poem in a workshop with Magdalena Montagne and share your cover ideas with editor, Elizabeth Schilling, to be included in History Journal No. 9, on Land Use, Preservation and The Environmental Movement. Repurpose old book pages and create poems on the pages in Black Out Poetry with Chloe Tsolakoglou. Learn how to make Pocket Zines out of A4 paper with Kevin Zavala-Zimerer. Be a part of the Word Quilt with MAH Intern Marilyn Padilla. Find a word you feel connected to and create a paper quilt square for it. Be inspired by the colors in Poetry Swatch with MAH Intern Radhika Tandon. Create a poem based on emotions, memories, and purpose of color in life. Add your community contributions to The Giving Tree with MAH Intern Stephanie Howe. Watch the leaves multiply as visitors share what they give to their community. William Ward Butler studied literature, creative writing, and education at the University of California, Santa Cruz. He’s a Writing Project Assistant for the Young Writers Program, and his poems have appeared in Assaracus, By&By Poetry, NightBlock, voicemail poems, and other journals. Carolyn Brigit Flynn is a writer and teacher dedicated to language as a pathway to soul and spirit. She is the author of the poetry collection Communion: In Praise of the Sacred Earth, and editor of Sisters Singing: Blessings, Prayers, Art, Songs, Poetry and Sacred Stories by Women, and The New Story: Creation Myths for Our Times. Her poems and essays have appeared in literary journals and anthologies nationwide. She teaches writing groups and retreats in Santa Cruz, CA and in Ireland. Little Giant Collective goes to the MAH! On Friday, March 17th the Little Giant Collective will be partnering with the MAH for their Poetry and Bookarts Fair! You will find us in the atrium with Print Organize Protest hosting a Politics and Poetry workshop. During the workshop we will be live printing political haiku on t-shirts and posters as well as live printing the collective's Political Haiku book for participants to cut, fold, and take home! We will also have a large accordion book for people to contribute their own political haiku, a pamphlet bookmaking station, and a print/make your own book mark station. Artwork from the collective will be available for purchase.